a flavorful combination of chickpeas, tahini, grilled chicken, tomatoes, red bellpepper with a citrus twist…topped with goat’s milk feta and parsley! heat grill to high (450-550 degrees). mix 1 tbsp. each lemon juice and oil, 1 tsp. garlic and 1/2 tsp each salt, pepper and cumin in a medium bowl. add chicken breasts and turn to coat. grill chicken, turning once, until cooked through and browned nicely. let chicken rest, covered for 5 minutes. whisk together remaining 2 tbsp. each lemon juice and oil, 1/2 tsp. each salt and pepper, and 1 tsp. cumin with the tahini in a large bowl. add chickpeas, tomatoes, onion, bell pepper and cucumber and toss lightly to coat. slice chicken on the diagonal and set on top of salads. sprinkle salads with parsley leaves and crumbled cheese. 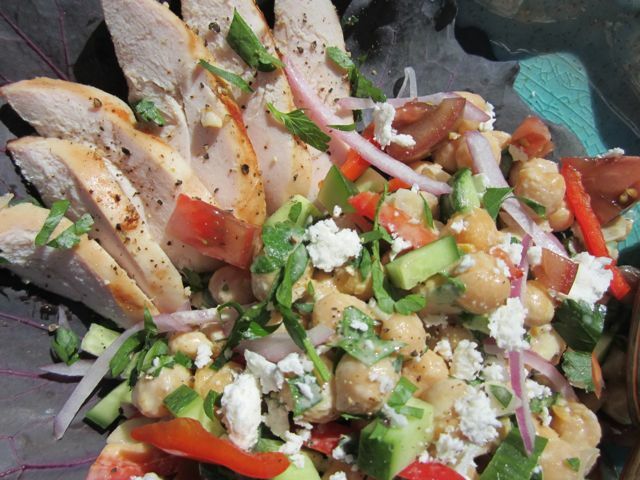 This entry was posted in chicken, salad and tagged chickpeas, fast, fresh, grilled chicken, tahini by elena. Bookmark the permalink.